Your Piero's pizza is almost done, but you can still fail big. Please follow exactly the instructions on how to put the toppings on your pizza. For the tomato sauce use approximately 4 1/8 oz. (this equals approximately 1/2 cup) passata (that is a thick & pure tomato sauce, some also call it pureed tomatoes). Pour the passata directly out of the pack onto the dough. Start in the center and form a spiral to the outer edge. Leave the rim intact. The tomato sauce for this pizza will cost you approximately US $ 0.16. Nothing but 100% pure tomato sauce! Click here if you are tempted to spice up your sauce. 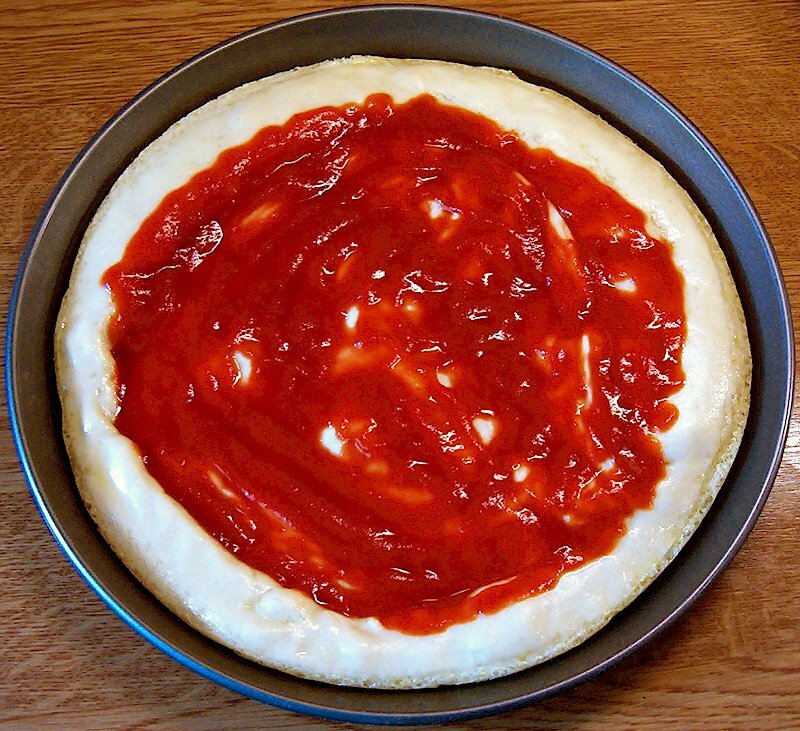 Many amateur chefs put sauces on their pizzas – e.g. ragù (meat sauce). This hides the individual topping flavors of the pizza. The individual flavor of an olive, a piece of onion or a slice of chili-pepperoni is important to the overall taste of a pizza. The unseasoned passata has its own flavor in the composition. If it is missing, all the rest will not taste good either. 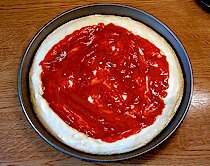 Although unseasoned pureed tomatoes do not taste yummy when eaten on their own, they add an important individual flavor to the distinctive taste of Piero's pizza. Do not use "pizza tomatoes" or similar canned "pizza sauces"! "Pizza tomatoes" are commonly understood to be chopped tomatoes and normally come in cans. The chopped tomatoes swim in their own juice, which is practically water. On the finished pizza this will result in small, flavorless pools of water. The bottom will become soggy, the toppings watery. "Pizza tomatoes" are no substitute for passata but actually additional toppings once the excess water has been drained off. Instead of canned tomatoes it is much better to use fresh tomatoes.